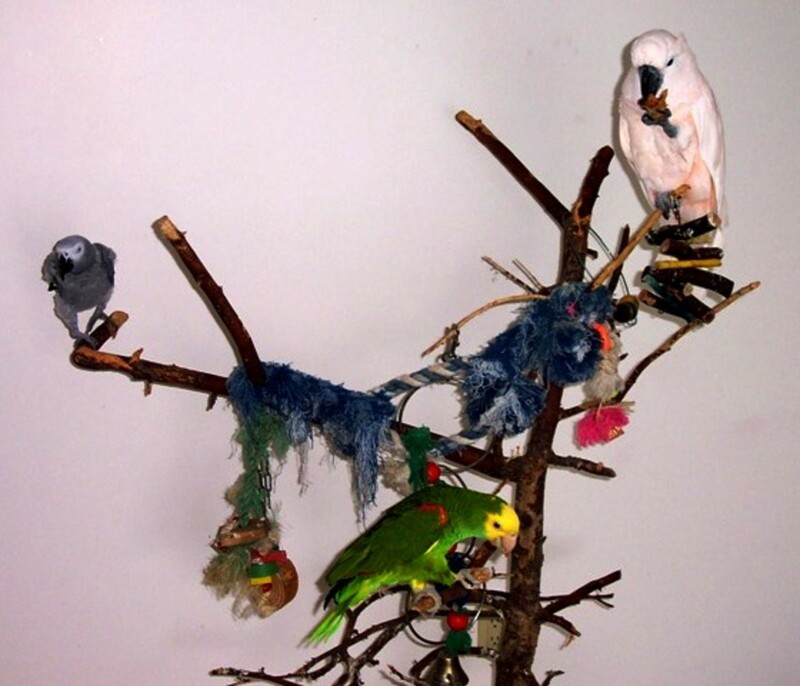 Muggles, Beaker, and Dino on their tree perch. “What’s going on there? Do you have a small child in the background?” asked the lady from Sears. She sounded puzzled—and with good reason. I’d been trying to place a catalog order over the phone. 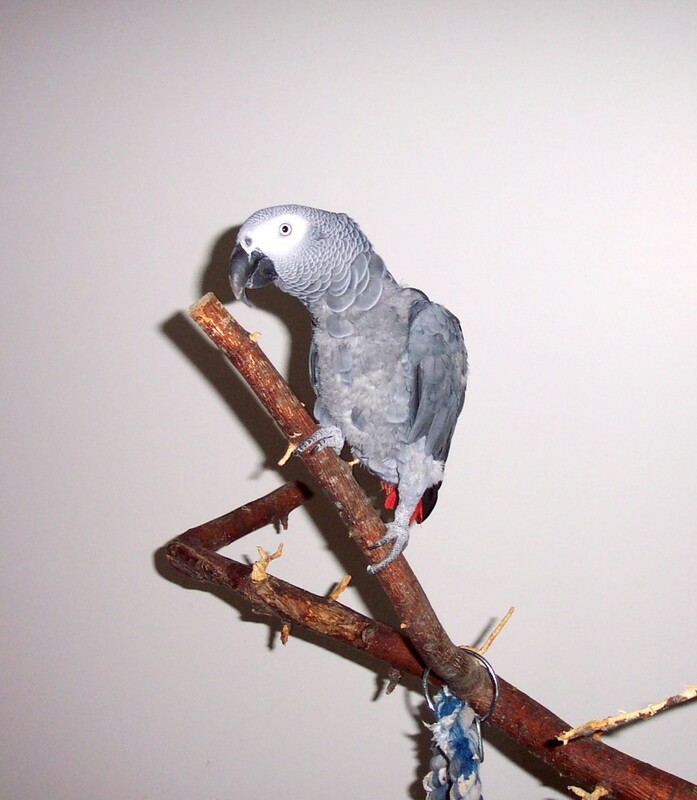 I say, "trying"... because my African Grey parrot, Bailey, had been hamming it up big time. 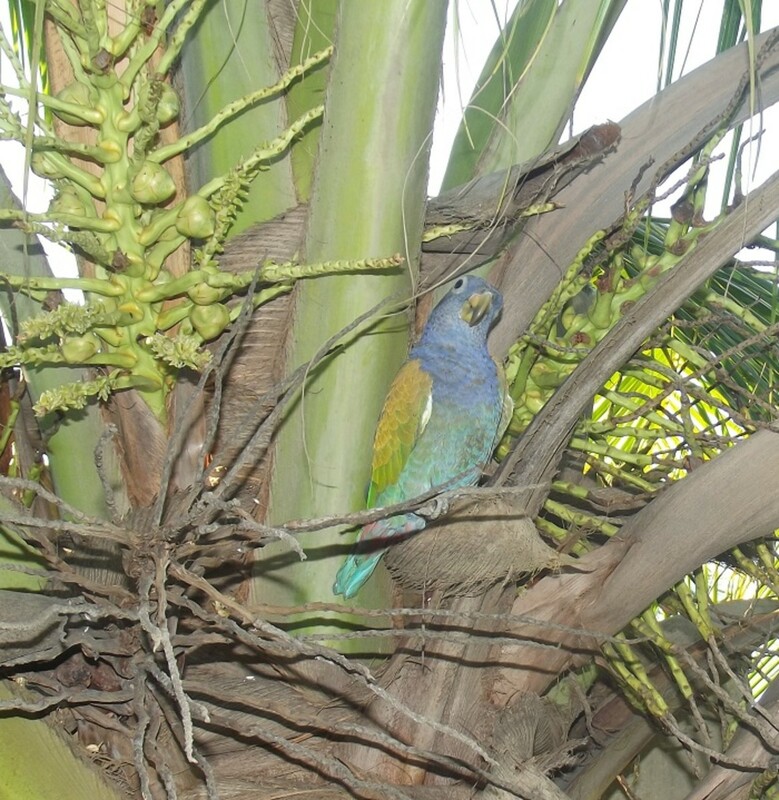 He kept interjecting: “Peek-a-boo. I see you. Gim-me a great big KISS!” (accompanied by loud smacking noises) into an otherwise normal phone conversation. Of course, “normal” is a relative term. 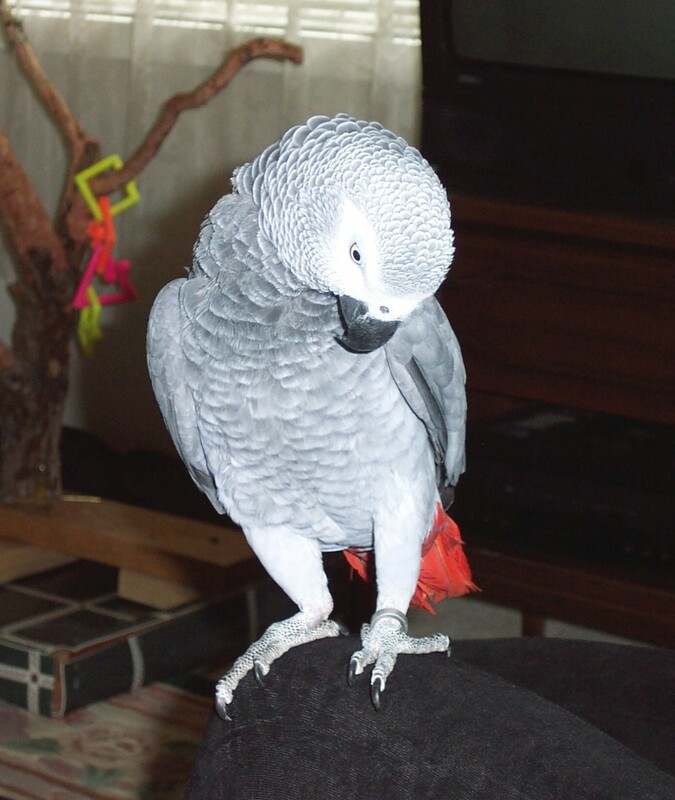 Those of us who share our lives with parrots have developed the unique ability to talk and hear over decibel-breaking background noises. 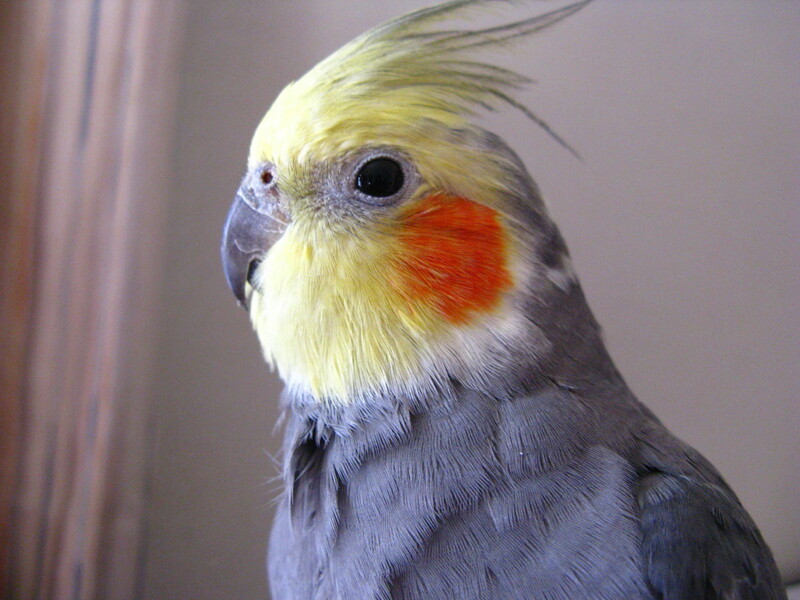 As a mother of two young children, I’d honed my skill of tuning out to what I thought was an accomplished level, then took this sanity-saving skill into the “masters” arena when I became a parrot parent. 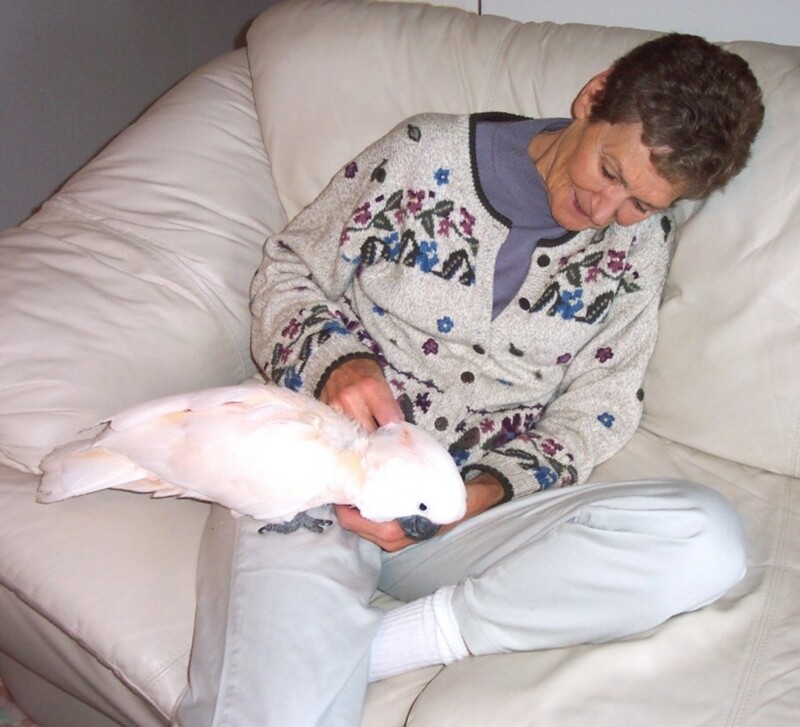 I could quite comfortably talk to anyone, in any situation, oblivious, forgetting I had feathered friends listening in and eagerly adding in their two cents worth. Naughty Child or Naughty Parrot? "It seems you have another child that loves to talk," the teacher said reprovingly, clearly annoyed. 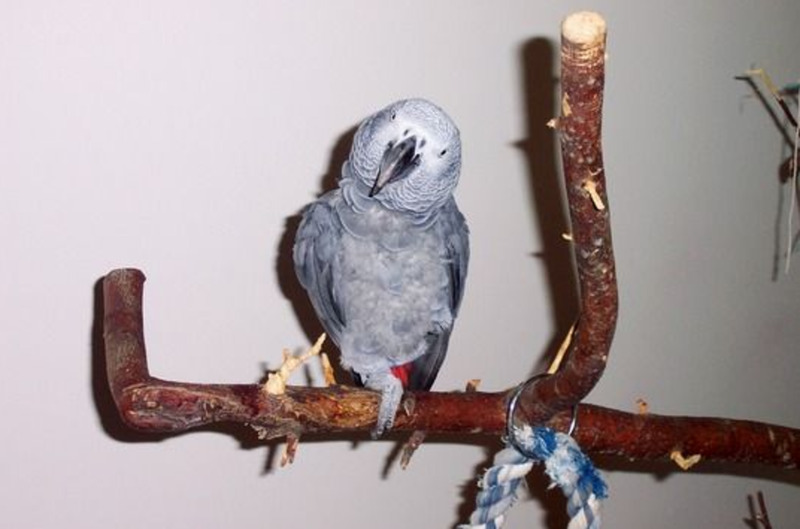 I told my caller I was home alone, then realized later, my parrot had been happily talking away in the background! This "oblivious skill" was brought home to me in a most embarrassing fashion, during a conversation I had with a schoolteacher. He’d called to tell me my son had the intrusive habit of interrupting, to discourse to the rest of the class. The teacher said that while they appreciated my son’s enthusiasm and eagerness to share his views, the consensus was, he had to learn to give others a chance to talk. “Oh no,” I confidently assured him," I’m home alone.” I could tell he thought we were a problem family and I was focusing in on this, not really paying attention to what I was saying. 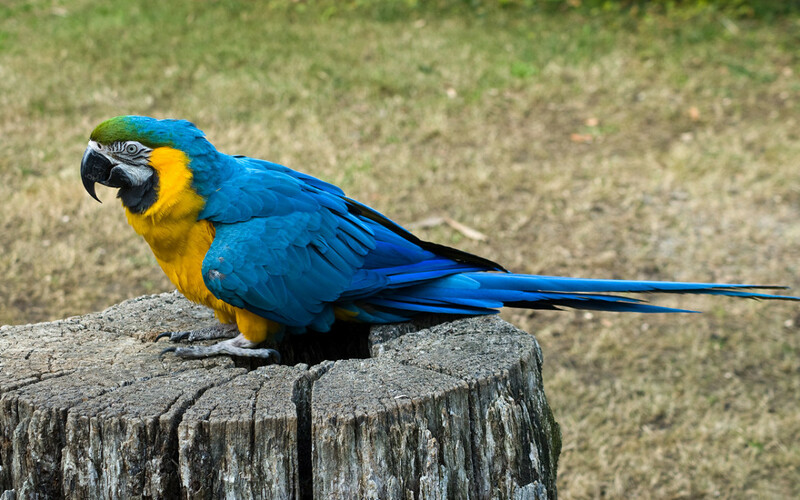 Upon later reflection, I realized how foolish this must have sounded--because one of my parrots had been yapping up a blue streak in the background! Beaker loved to garner attention by coughing. 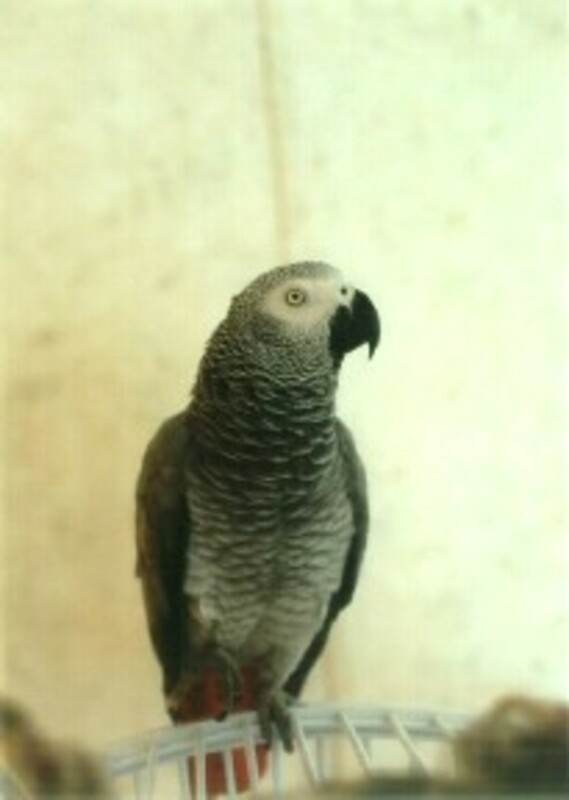 He was so convincing, visitors wondered if he was ill.
Another Grey parrot of ours, Beaker, came to us from rough circumstances. Beaker, at first, was rather quiet, but showed that, he too, enjoyed playing to an audience. He underwent a Jekyll-and-Hyde-type transformation whenever company came to visit. Beaker would wait until conversation was underway, then engage in a stellar performance, giving a gravelly-sounding rendition of a smoker's cough: "Hoo-wuh! Hoo-whu! Hoo-wuh!" leading visitors to express concern over his health. 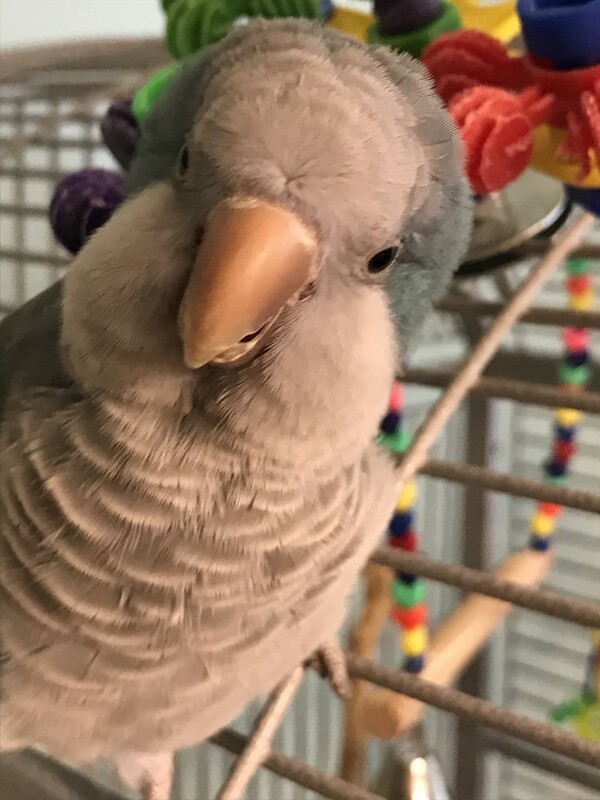 The telemarketer seemed convinced I had a "boozer" in the background and her tone of voice indicated that she viewed my telling her it was actually my parrot asking for a drink, as just a pathetic attempt to cover for a drunken partner. Beaker recently gave us some startling insights into his former home life. A telemarketer contacted us one evening, phoning right around supper-time. The marketer started into her sales pitch, but her words trailed off, when Beaker, in a voice that would have made any bar patron feel right at home, said leeringly. "Want a... drink? Need a drink. Well, come on... gim-me a drink!" "Is there a... problem?" the telemarketer asked archly. 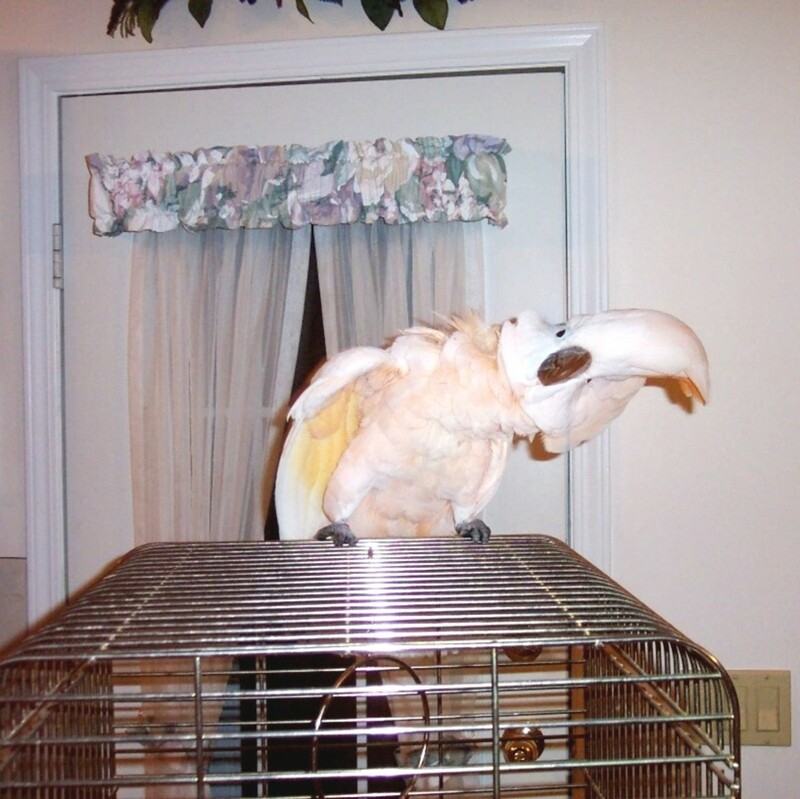 I tried to explain that it was only my parrot talking but I don't believe she was convinced. I remember when Bailey insulted my husband's sister, Merilee. She stepped through the doorway and Bailey sang out in a cheerful voice, "Hi-ya tubby." At least, that's what Merilee thought she heard. Bailey had taken to greeting visitors by saying, "Hi-ya lovey" to them, which we tried to convey to Merilee, but she remained convinced that Bailey had commented on her appearance. She said with resignation, "Huh, even the bird notices I'm overweight." She took a seat on the sofa and pointedly ignored Bailey. 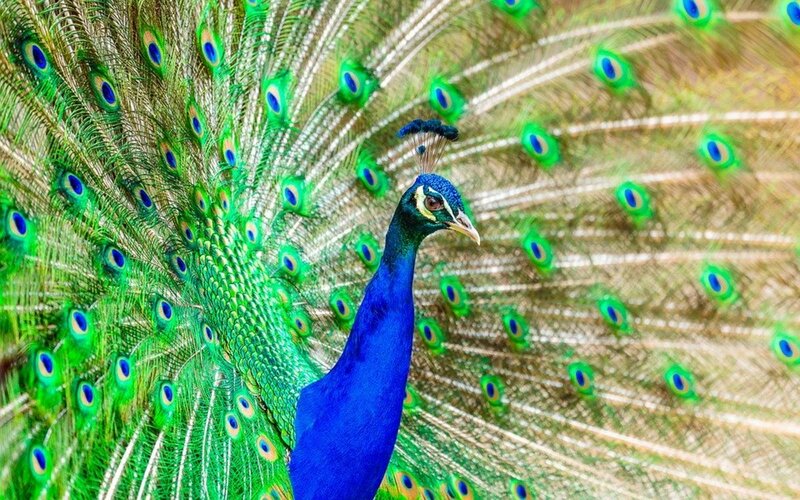 He must have sensed her reserve because he postured and vocalized, outdoing himself trying to capture her attention. Finally, he eyeballed her sternly, bobbed his head up and down, and commanded, "Exercise. Come on, get your EXERCISE! One-two, one-two." Merilee's head snapped around and she glared at Bailey. "That's it!" she said, absolutely floored. "That bird is too knowing somehow." Merilee said Bailey gave her the creeps. She has never forgotten Bailey's disparaging remarks and avoids him whenever she comes to visit. In another incident, we saw that even sacred moments could have a humorous side. My sister, Dee, dropped over, bringing an impromptu dinner. We were standing in the kitchen giving a blessing, when Bailey, who was smitten with her, revealed his true feelings during a pause in the prayer. 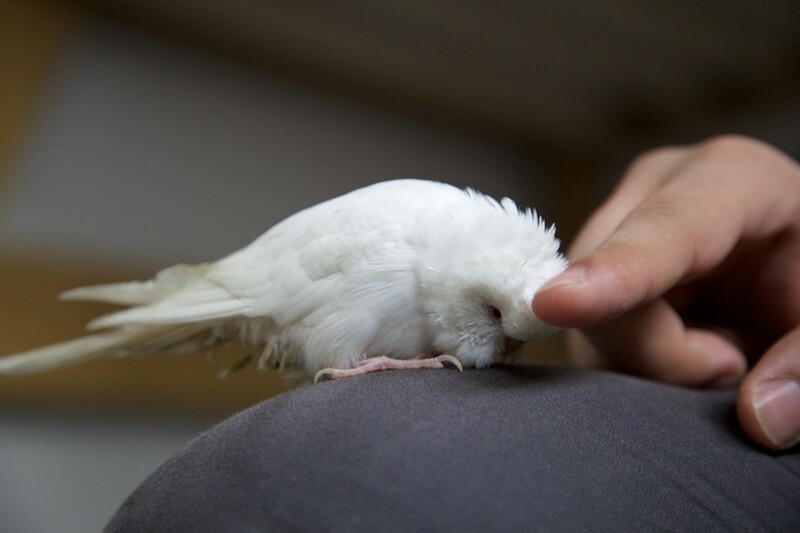 "I missed you, Dee," he declared tenderly. "I love you, Dee." My husband, stunned, lost his train of thought; my sister giggled; the rest of us, all composure lost, cracked up, laughing helplessly, the prayer completely forgotten. 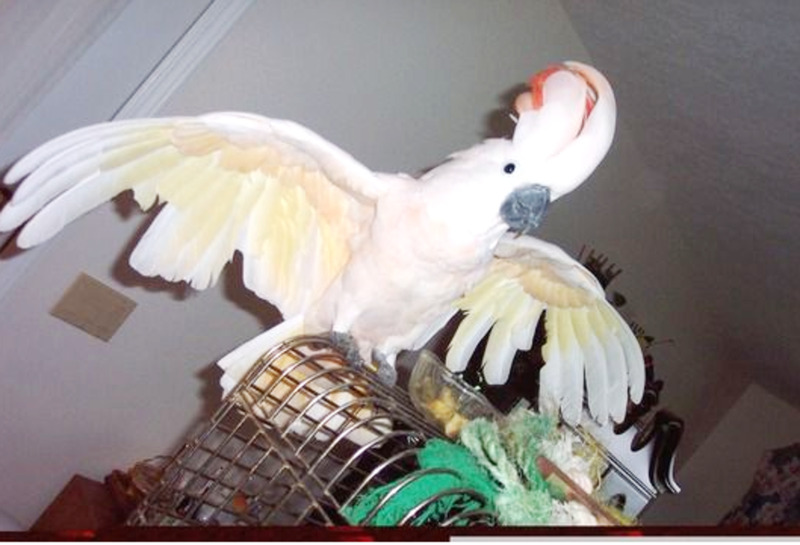 The newest addition to our family, a Moluccan Cockatoo named Miss Muggles, (who, in hindsight, I believe, should have been called Miss Snuggles) puts on her goofy act whenever visitors come to call. She puffs up and pretends to be menacing, then, when this has lost its effectiveness, she dances, bobs, and lurches drunkenly from side to side, trying to recapture attention. When nervous visitors understandably back off, she chastises them by launching into an unintelligible round of loud scolding. Most people retreat to the safety and hoped-for quietness of our living room, but Muggles then calls out insistently, "Hello? Hello? Hello?" I know the best course is to bring her into the room, allowing her to see our company. I try to temper her enthusiasm but am often hard-pressed, because she'll launch into an ear-splitting cawing--until I allow her to run across the rug and up the nearest leg! The walls reverberated with maniacal laughter. The other evening, I was again on the phone, foolishly thinking my office would be a quiet place to conduct an interview; however, I made the mistake of leaving the door open. I shake my head at my failure to learn from past experiences. Muggles and Beaker decided it was happy hour—and all the better because "mom" was on the phone. Muggles started laughing. Beaker, not about to be outdone, joined in. Muggles laughed back and Beaker copied her. The volume increased. "HAH HAH HAH HAH HAH!" Soon, the walls reverberated with maniacal laughter. The fellow I was speaking with, said, "Good grief It sounds like you live in an insane asylum." I had to agree with him. I've learned that days and nights are never dull when you've got birdies in the background. 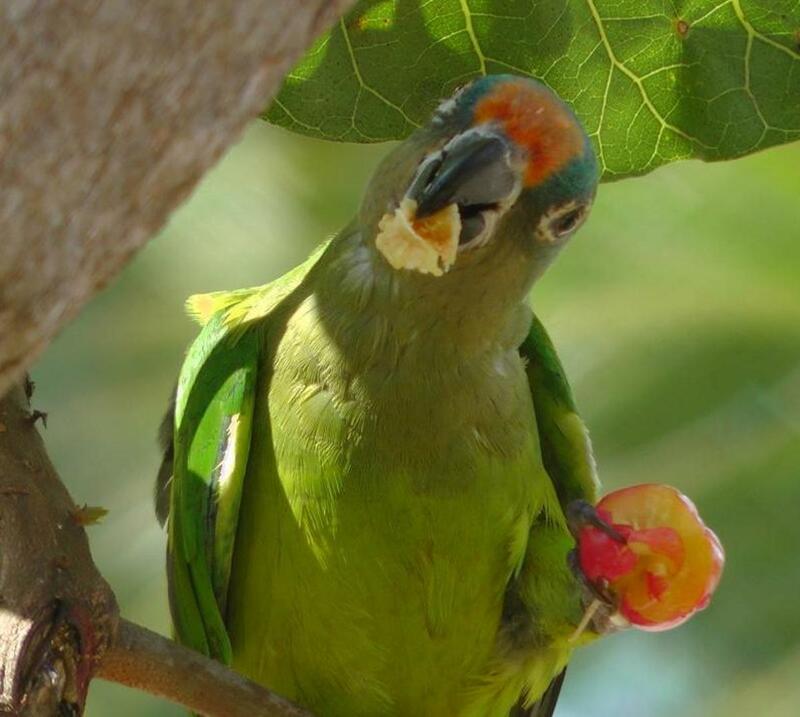 In "Look Who's Talking," parrots sing opera, play catch, open and close doors, slide down banisters, demolish a car, and engage in other playful and naughty behavior. One of my all-time favorite documentaries about parrots, as seen in their colorful beauty in the wild and in homes around the world. 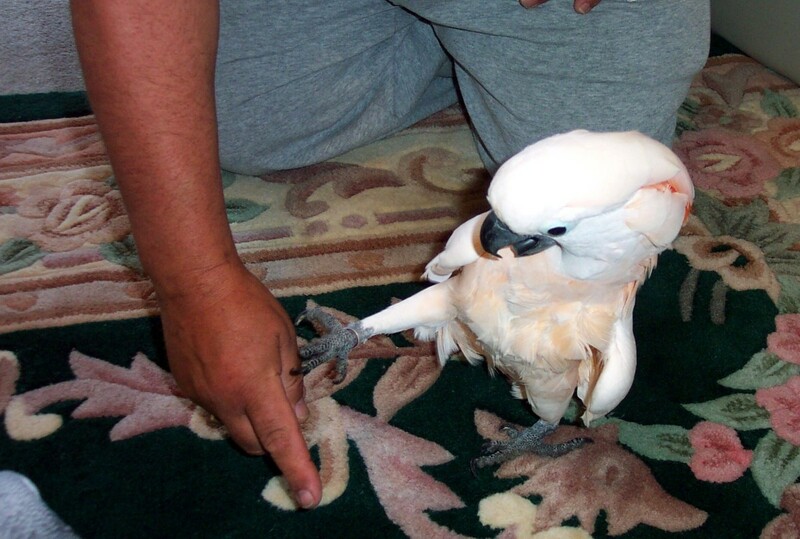 How these birds interact with their owners is especially touching and downright adorable. An invaluable addition to the home library. 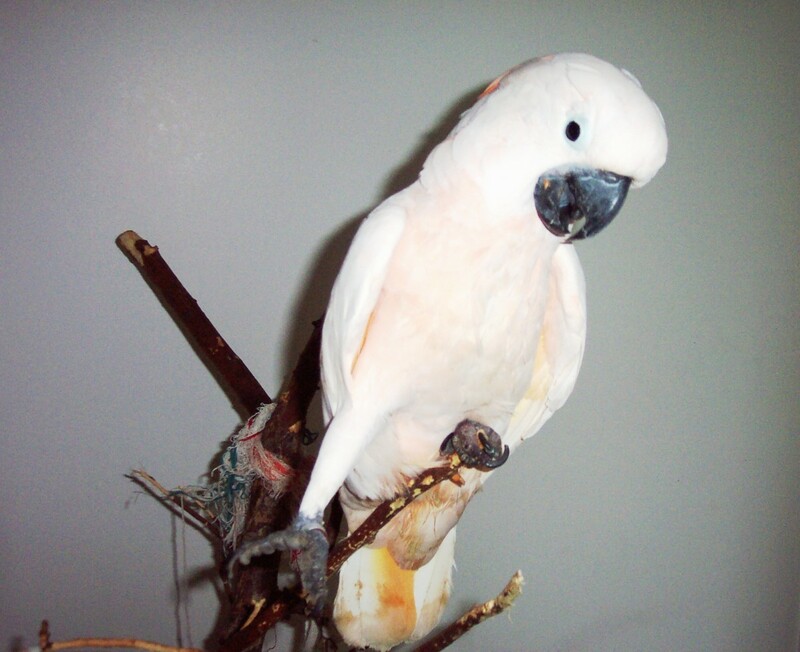 Have You Ever Lived With a Parrot?